Morning rush hour, and a bus swings past me near the railway station. My thumb presses the AF-ON button like there’s no tomorrow – and I’ve time for just a single frame before the scene whirls on by. Its not sharp, its not good quality – but then, is quality really important? 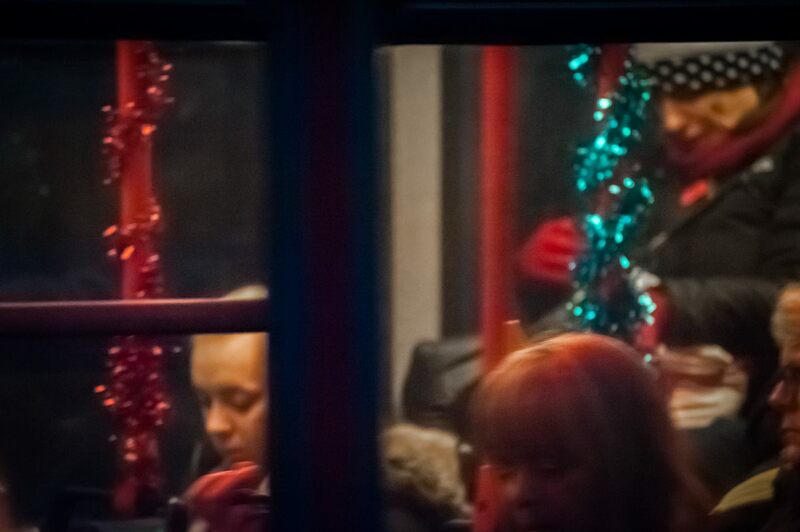 I’d rather have content and the moment, and here is the feeling of a winter morning’s bus ride into work, in this case a bus run by one of Bristol’s smaller companies who have twirled festive tinsel here and there regardless of expense(! ), which I do think a nice touch – a small but very human touch perhaps, amidst the festive season’s burgeoning commercialism. Outside the bus, it’s cold and dark, and there’s a strange and slightly unsettling old man with a large camera. But inside this hurtling, wheeled, glass and steel behemoth all is bright, close and warm, very probably overwarm because the heating is turned right up, and everyone is packed tightly in and wrapped up tropically against the winter’s cold. Most gaze down into their mobile phones, a good source of distraction from this unenjoyable but necessary reality. When I travelled in buses like this at hours of the day like this, I often didn’t want to get to where I was going, but I went there anyway. Earlier images from this series are: here, here, here, here, here, here, here, here, here, here and here. Click onto the image to open a larger version in a separate window – only as I’ve said, its not sharp. D700 with 70-300 Nikkor lens at 300mm; 1/100th, wide open at f5.6; 25,600 ISO; central Bristol; 2 Dec 2016. Oui, c’est ca – and I find this atmosphere interesting, it is interesting being there – but perhaps only because, being old and retired, I’m no longer involved! Great series. Quality can be defined many ways, an appreciated photo can be quality. And if by quality you mean sharp, have a look a Capra’s war photography. Some of the most enduring images lack in some quarter but they have quality. Emotion, mood etc. are a quality we would all wish to have in our photos. I think we must have been on the same bus! Your photo captures the mood beautifully.